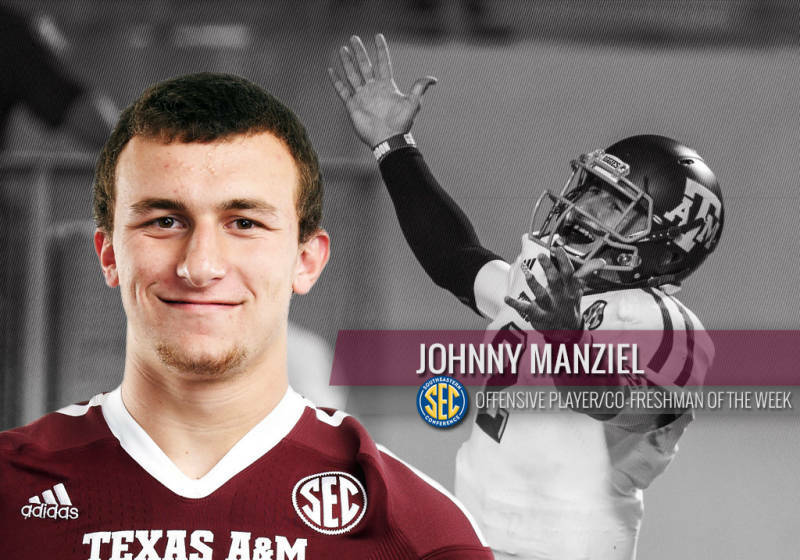 Texas A&M Aggie Johnny "Football" Manziel First Freshman to Win Heisman? Dan Rather Says Yes! Texan Dan Rather, whose long career as a journalist (that included being the face of CBS 60 Minutes) ended in shame due to a false report about President George W. Bush's National Guard Military service, has endorsed Texas A&M Quarterback Johnny "Football" Manziel for Heisman. I know, you are scratching your heads right about now. What is Dan Rather doing getting involved in something like this? Maybe he is trying to win back favor from his fellow Texans who were embarrassed that he was from Texas after he was fired for lying about our former Governor and Texan U.S. President Dubya. Dan Rather endorsed Manziel during an interview with www.TexAgs.com. Dan Rather is a graduate of Sam Houston State University and the interview was done right before the Texas A&M vs. SHSU football game. The interview did include more than just football talk. My favorite part of the interview was when Dan Rather talked about how he worries about there being a lower standard in journalism due to the digital era and new technologies that get news out on the internet faster than ever before. Yeah, Dan Rather worrying that journalism standards have lowered gave me a chuckle too. On a different note though, Dan Rather endorsing someone in the Heisman Trophy race is not all that unusual considering the politics behind football. Last year I wrote an article (Texas A&M has Fired Aggie Football Coach Mike Sherman - Will Politics Decide Next Coach?). The article was about how politics and money play huge roles in Football in Texas. Big, influential donors can threaten to stop giving money to a school if the donor thinks the school needs a new football coach. Politics plays a bigger role in football than people think. When Texas A&M was talking about moving from the Big 12 to the SEC, the Texas Legislature called a meeting to discuss the implications of a potential move. Members of Congress have called for investigations into the BCS because it does not have a playoff system and less well known football teams can go undefeated and still miss out on the BCS Bowl money. There is a 4 team playoff coming soon though because of the opposition to a team getting picked as the national champion when there is no playoff to prove who the true best team is out of the top teams. People call the BCS Football National Champion the "Mythical National Champion." Politics aside, Johnny Football really is the best individual player in College Football, and in the history of College Football for that matter, and therefore he should win the Heisman. Politics has kept the Heisman voters from wanting to pick a Freshman to win the award, but if there is any freshman deserving of winning the Heisman, it is Johnny "Football" Manziel. I am not saying this just because I am a graduate of Texas A&M University. I am saying this because the Johnny "Football" Manziel statistics are just mind blowing, and just think how much more mind blowing his statistics would be if he played full games this year (Manziel sat out for 8 quarters this year to let other Aggie Quarterbacks get some play time in the blowout games!) Move over Vince Young, Texas has a new star! Manziel's ability to make big plays has even led the Aggies to a top 10 BCS ranking, an elite team in the SEC, and a win against #1 Alabama. Oh, and for good measure, check out the video below to see some of Johnny Football's greatest moments. Finally, remember when I said that politics plays a big role in Football? Well, that is one of the reason's I wrote this article. Part of the politics of winning the Heisman is that your chances go way up if you can win the battle of getting the most hype and news coverage. So Go Johnny Football! Represent the Great State of Texas! You were, after all, a product of Texas Friday Night Lights. A Heisman win for you beings good media coverage and money into Texas.